USA: David Hoffmann. Hardcover. Approximately 300 pages in large binder. Undated but appears to be circa 2000. 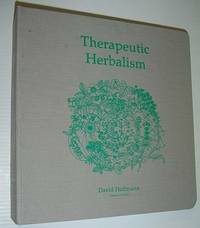 "Written as a response to the need for a clinically oriented approach to the use of herbal medicine in North America... Intended to be used by herbalists, professional health practitioners and students of holistic medicine. Divided into the following 10 lessons: An Overview of Phytotherapy; The Digestive System; The Cardio-Vascular System; The Respiratory System; The Nervous System; The Urinary System; The Reproductive System; The Musculo-Skeletal System, including the skin; The Immune System, including the endocrine system; Approaches to the health needs of the young and elderly. Light wear. Occasional markings to contents. Prior owner's name neatly clipped from top corner of title page. Nice copy. . Very Good. 2000. First Edition.